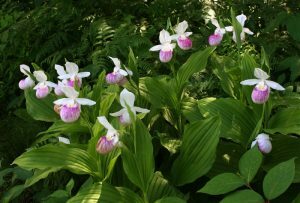 Photo: Pink Lady-slippers, wild orchids in a bog at Itasca State Park, Minnesota. Listed below are full citations to a sample of ten of my scientific papers selected less for their scholarly impact than for their topical and chronological range within peer-reviewed journals. They are listed from most recent to oldest. Each date is followed by a SUBJECT IN CAPS, a general title and italicized comment in dark red ink, the full citation in black, and an internal link to a PDF in blue. I provide these under my interpretation of “fair use” copyright law. For all other articles, link to Curriculum Vitae. 2000 – EARTH SYSTEM SCIENCE – Glacial Tectonics: This invited review sums up a decade worth of ideas involving the link between glaciers and tectonism. Thorson, R.M., 2000, “Glacial Tectonics. A Deeper Perspective,” Quaternary Science Reviews, V. 13-14, p. 1391-1398. For an internal PDF, link to: 2000 PG GlacialTectonics .